Welcome to our Weekly Cannabis Report, a reliable source for investors to receive the latest developments and analysis in the cannabis sector. The cannabis sector continued its selloff last week. The Horizons Marijuana Life Sciences Index ETF (OTC:HMLSF) declined 6.1% while the U.S.-listed ETFMG Alternative Harvest ETF (MJ) also declined 5.8%. Canadian Large-Cap: This group struggled to come back from the recent losses as Tilray (TLRY) led the group with a 25% decline. Aphria (APHA) gained 7.1% and Aurora (ACB) gained 1.9% to recoup some of the prior losses. Cronos (CRON) declined 11.3% after receiving a $1.8 billion investment from Altria’s (MO). Canopy (CGC), CannTrust (OTC:CNTTF), and TGOD (OTCQX:TGODF) were both down slightly with no news. HEXO (OTCPK:HYYDF) and Organigram (OTCQX:OGRMF) both reported earnings last week including $5.2 million of legalization sales reported by HEXO for the quarter ended on October 31, 2018. 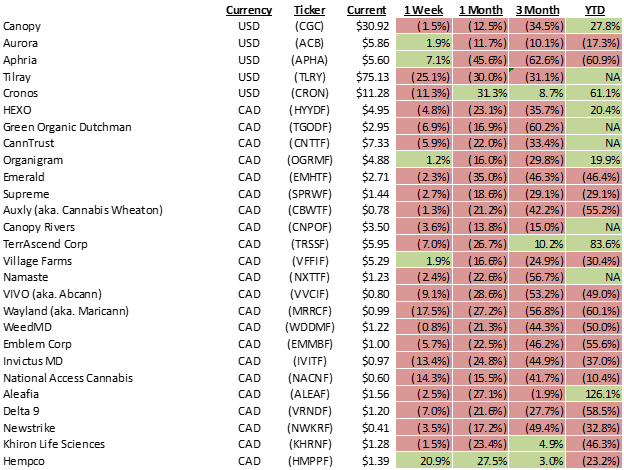 Canadian Small/Mid Cap: Most of the small to mid-cap stocks declined after the Aphria short report dampened investor confidence in the cannabis sector. Namaste (OTCQB:NXTTF) continued its brutal losing streak with a 2.4% loss. Khiron Life Sciences (OTCQB:KHRNF) lost 1.5% despite announcing approvals to enter the Mexican market. National Access Cannabis (OTCPK:NACNF) and Alcanna (OTCPK:LQSIF) were roiled as Ontario announced a lottery of only 25 licenses for the initial cannabis retail rollout citing supply concerns. We initiated coverage for Hempco (OTC:HMPPF) which jumped another 21% last week after the 2018 Farm Bill cleared the House. U.S. Sector: The U.S. cannabis sector was slightly down overall. Liberty Health (OTCQX:LHSIF) gained 14.8% after losing 37.6% the prior week due to short attack. Trulieve (OTCPK:TCNNF) lost 3.6% amid concerns that Florida might scrap its cap on cannabis licenses. Curaleaf (OTCPK:LDVTF) was down 2.9%, Green Thumb (OTCQX:GTBIF) was down 2.3%, iAnthus (OTCQX:ITHUF) was flat, and Charlotte’s Web (OTCQX:CWBHF) was down 4.1%. 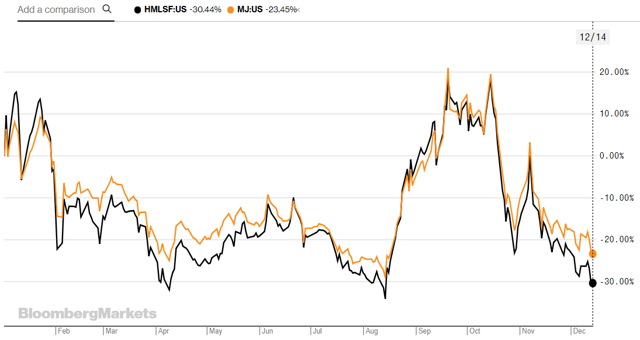 MedMen (OTCQB:MMNFF) gained 3.4% and we published a discussion of its lavish executive compensation last week. Body & Mind (OTCPK:BMMJ) continued its losing streak with an 18% decline last week after announcing that its applications for 4 additional licenses in Nevada were unsuccessful. Turning to recent listings, Acreage Holdings (OTC:ACRZF) dropped 8.7% and is now 35% below RTO price. MJardin (OTC:MJARF) lost another 14% last week and now trades 67% below its RTO price. Harvest Health (OTC:HTHHF) gained 8.5% last week and sits at 25% below RTO price. Pick-and-shovel plays KushCo (OTCQB:KSHB) lost 1.5% while Innovative Industrial Properties (IIPR) was up 4.3%. We recently initiated coverage on several U.S. stocks, including Origin House (OTCQX:ORHOF), Planet 13 (OTCQB:PLNHF), Body and Mind, and 1933 Industries (OTCQB:TGIFF). Check out “Best Ways To Play The U.S. Cannabis Industry (Part 2) for a primer on the U.S. cannabis sector. The Ontario government just dealt a major blow to the private retailers that are eager to enter the largest market in Canada. Back in July this year, Ontario announced that it will rely on private retailers for brick-and-mortar cannabis sales. In October, the government announced further details including limiting each LP to one license and their ownership in affiliated entities to be less than 9.9% in order for the affiliates to be eligible for additional licenses. However, in yet another reversal, the Ontario government announced last week that it will only issue 25 retail licenses by April 1, 2019, due to nationwide supply shortages. 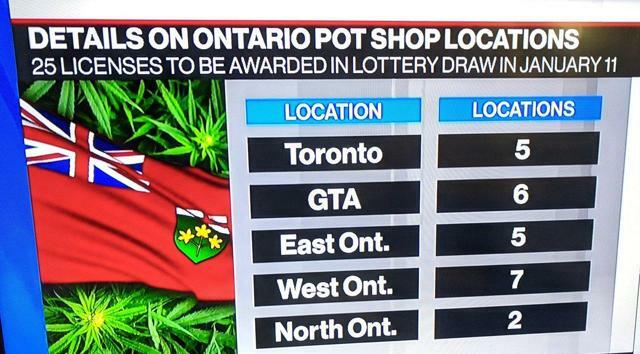 The licenses will be decided through a lottery system and are allocated to five areas within Ontario. Notably, the city of Toronto will only get 5 licenses which are significantly lower than our prior expectations. Another major negative development for the cannabis retailers in Ontario emerged when the city of Mississauga and Markham voted to opt out of the provincial cannabis retail system. This means that there will be no physical cannabis stores allowed in these two cities which have more than 1 million residents together. Other municipalities could also opt out before the January deadline and more importantly the city of Toronto, the largest urban market in Ontario has yet to decide whether it will allow cannabis retailers. There have been numerous industry reports that indicated a large number of leases have been signed across the province in anticipation of the market opening in 2019. The province has said that it will issue an unlimited number of retail licenses and there could be up to 1,000 stores eventually. The biggest loser from this policy fallout is the cannabis retailers including Alcanna and National Access Cannabis, both of which are publicly traded and have seen their share price plummeting in recent weeks. The 2018 Farm Bill has passed both the Senate and the House, which means that hemp cultivation will become federally legal once President Trump signs the Bill into law. CBD stocks have had a significant run-up recently and we are seeing a similar “sell the news” last week. Regarding Nevada’s recent license applications, MPX (OTCQX:MPXEF) won 4 and Green Thumb won 8 licenses. Body and Mind announced that it was unsuccessful in its applications. The cannabis sector continues to experience a protracted downturn, just as we predicted in our September article “Are We Heading Into Another Meltdown For Pot Stocks?” We told investors that the market was heading towards a selloff and it could last for months, similar to the 6-month downturn we saw in January this year. Some had hoped that the Altria investment in Cronos could spark another wave of investor interests but the sector continues to struggle amid a deepening selloff in the global equities market. We think the current risk-off sentiment has affected the cannabis sector disproportionately as investors cut back risky positions and focus on defensive sectors. To cope with the current difficult market condition, we think investors should focus on the highest quality names and cut back exposure on the more risky small-caps. Good luck to all this week!